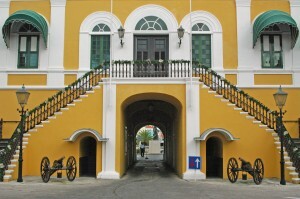 WILLEMSTAD – The four political parties MAN, PAR, PNP and PS are in the process of forming a new government for Curaçao. The meeting this afternoon with the four parties comes after a bilateral meeting between the boards of MAN and PAR. During this meeting, in which no negotiations were held, the parties discussed the distribution of the portfolios. MAN, which opted in the first place for the portfolios of Finance and Education, Science, Culture and Sports (OWCS), but also Social Development, Labor and Welfare (SOAW), wants now Economic Development, OWCS and SOAW. The second biggest party in the possible coalition, PAR, does not agree with this and is not willing to give away Economic Development so easily. The party has already indicated before the election that it wants to maintain this portfolio in any subsequent government. After the elections of October 5, the outgoing Minister of Economic Development Eugene Rhuggenaath (PAR) received 6431 votes. Only Gerrit Schotte (MFK) managed to win more votes than Rhuggenaath. According to the PAR, Rhuggenaath was rewarded by the people for his accomplishments as the Minister of Economic Development. PAR wants Rhuggenaath to stay as Minister of Economic Development in the next government.